April 3, 2019: SCIPP Member, and UCSC Astronomy/Astrophysics Professor, Constance Rockosiin quoted in two articles as the DESI/Dark Energy Spectroscopic Instrument lenses see first light! LBL article, "Dark Energy Instrument's Lenses See the Night Sky for the First Time", and Symmetry Magazine article"DESI lenses see first light"! Congratualtions to SCIPP Grad Student, Ben Lehmann, for winning a place as one of the 10 finalists in the UCSC Grad Slam! 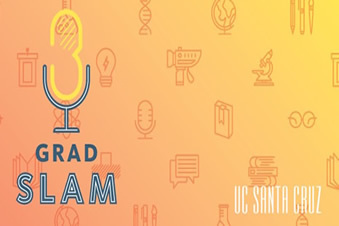 Come support Ben at the UCSC Grad Slam which takes place on Friday, March 8, 5:30-8:00pm at the Kuumbwa Jazz Center. Friday, February 1, 2019: SCIPP Outreach in the QuarkNet Friday Flyer! Spotlight on the SCIPP University of California Santa Cruz QuarkNet Center SCIPP is the Santa Cruz Institute for Particle Physics, the particle physics research institute at the University of California, Santa Cruz. 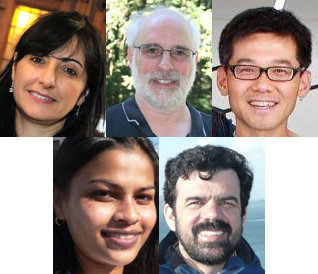 Their main work in QuarkNet in the past few years has been to run great ATLAS masterclasses. The "SCIPP center" is headed up by mentor Jason Nielsen and administrator Vicki Johnson. Teachers in the group participate in many ways, including those masterclasses. 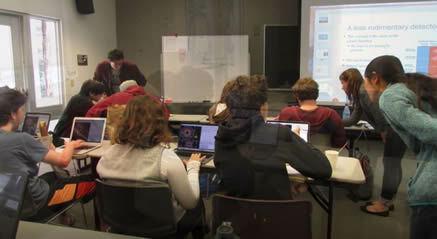 Last November, SCIPP center teacher Jonathan Rockman lead his students in World Wide Data Day. SCIPP Member, Jacob Pasner, in Symmetry Magazine: The farmer physicist: A graduate student looks for belonging inside and outside academia, 01/22/19 By Sarah Charley. SCIPP Member, David A. Williams, in the UCSC News: Scientists to inaugurate a new type of gamma ray telescope at Whipple Observatory The prototype Schwarzschild-Couder Telescope (pSCT) is designed as a pathfinder telescope for the Cherenkov Telescope Array. Congratulations to SCIPP Grad Student, Jacob Pasner, for his winning lightning round talk at this year's USLUA meeting! 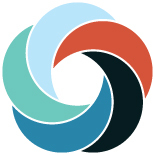 A brief statement from Jacob: I'm very excited for the opportunity to represent SCIPP and ATLAS this coming March as a particle physics advocate to US congress representatives. I'd like to thank the USLUA for offering me this opportunity, my advisor Dr. Jason Nielsen for his continuing support and Dr. Giordon Stark for nominating me to give this Lightning Round Talk. October 19, 2018: SCIPP Member, Giordon Stark, was quoted in a recent write-up about CERN! September 17, 2018: SCIPP Member and UCSC Physics Professor, Howard E. Haber, APS Physics Viewpoint: Higgs Decay into Bottom Quarks Seen at Last. Two CERN experiments have observed the most probable decay channel of the Higgs boson—a milestone in the pursuit to confirm whether this remarkable particle behaves as physicists expect. July 12, 2018: David Williams, SCIPP Member, adjunct professor of physics at UC Santa Cruz, and a member of the VERITAS collaboration, quoted in UCSC news story: "VERITAS supplies critical piece to neutrino discovery puzzle Potential connection between blazar and neutrino detection by IceCube observatory marks a new advance in multi-messenger astrophysics". June 11, 2018: Perspectives on 10 Years of Discovery with Fermi: By capturing the most energetic light in the sky, the spacecraft continues to teach us about the mysteries of the universe. By Peter Michelson, and SCIPP Members, William Atwood and Steven Ritz. June 11, 2018: Astronomy Picture of the Day (APOD), At Last GLAST: Image Credit: NASA, DOE, Fermi Gamma-ray Space Telescope Collaboration. Explanation: Rising through a billowing cloud of smoke, a long time ago from a planet very very close by, this Delta II rocket left Cape Canaveral Air Force Station's launch pad 17-B at 12:05 pm EDT on June 11, 2008. Snug in the payload section was GLAST, the Gamma-ray Large Area Space Telescope. 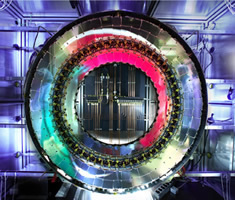 GLAST's detector technology was developed for use in terrestrial particle accelerators. So from orbit, GLAST can detect gamma-rays from extreme environments above the Earth and across the distant Universe, including supermassive black holes at the centers of distant active galaxies, and the sources of powerful gamma-ray bursts. Those formidable cosmic accelerators achieve energies not attainable in earthbound laboratories. Now known as the Fermi Gamma-ray Space Telescope, on the 10 year anniversary of its launch, let the Fermi Science Playoffs begin. May 21, 2018: SCIPP Member, Professor David Smith, and SCIPP alumni graduate students, Dr. Greg Bowers and Dr. Nicole Kelly, in the UCSC News with ADELE, "Lightning in the eyewall of a hurricane beamed antimatter toward the ground". ! May 13, 2018: AESOP-Lite, the cosmic rays experiment SCIPP Members, Professor Robert Johnson, and Graduate Student Sarah Mechbal, have been working on, with a group at the University of Delaware, should** be launching from Esrange, Sweden at 0000 UTC (3.00pm PST) for a 5 days flight to Northern Canada. It is possible for everyone to watch the live stream (already going) provided by the Swedish Space Corporation, and to track the trajectory of our payload across the stratosphere. **There is always a chance the launch may get moved to another date if the winds pick up. Please check the website for more information! Wish them luck! SCIPP Graduate Student Christian Johnson was a panelist, with other astrophysics luminaries, at the recent Silicon Valley Comic Con! 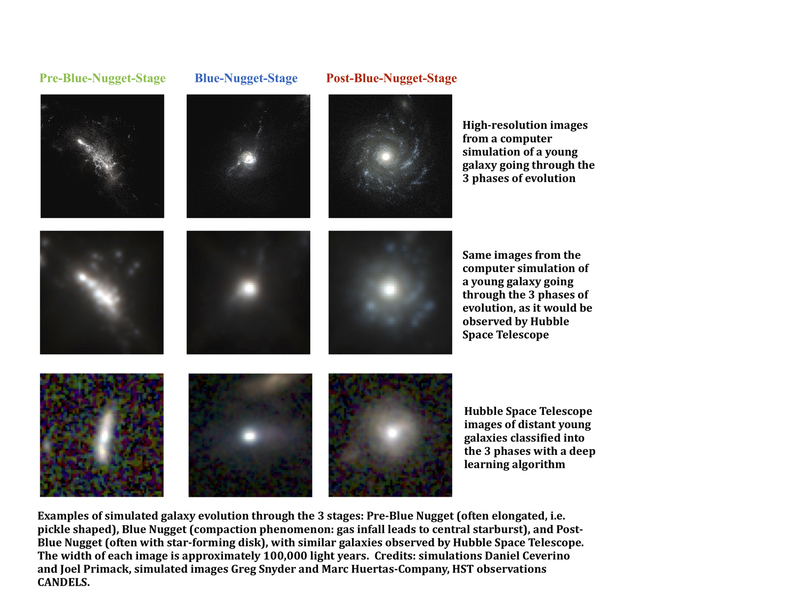 April 23, 2018: SCIPP Member, Professor Joel Primack, in the UCSC News: "Face recognition for galaxies: Artificial intelligence brings new tools to astronomy: A 'deep learning' algorithm trained on images from cosmological simulations has been surprisingly successful at classifying real galaxies in Hubble images". Congratulations to SCIPP Member, Physics Professor, and Project Lead, Bruce Schumm, for the Winter/Spring 2018 Launchpad grant award! Prof. Schumm, and fellow PI's Simone Mazza and Hartmut Sadrozinski, applied for funding for their project Radiation Hardened AC-Ultra-Fast Silicon Detector (UFSD) through "Launchpad" which is part of the UC Santa Cruz SPLICE program, funded by the State of California Assembly Bill (AB) 2664 innovation and entrepreneurship program. February 21, 2018: SCIPP/Physics Graduate Student, Christian Johnson, quoted in the UCSC News about the recent paper, Novel search strategy advances the hunt for primordial black holes. Also, be sure to check out his Grad Slam Presentation: Searching for Primordial Black Holes ! February 15, 2018: SCIPPer and UCSC Astronomer, Alexie Leauthaud, wins Sloan Research Fellowship! December 18, 2017: Two new ATLAS news releases that feature exciting results from our SCIPP ATLAS group including SCIPP Members Prof. Mike Hance, and Graduate Student Sheena Schier! December 11, 2017: SCIPP Member, UCSC Professor Tesla Jeltema, in the news with a UCSC News article: Physicist Tesla Jeltema probes the mysteries of dark matter and dark energy. Jeltema has a leading role in the Dark Energy Survey, a major international collaboration that is gathering precise measurements of the evolution of cosmic structure. November 20, 2017: SCIPP Member and UCSC Physics Adjunct Professor Emeritus, Terry Schalk, elected 2017 AAAS Fellow! Congratulations, Terry! Congratulations to SCIPP Member, Professor Michael Dine, who has been selected as a 2018 recipient, together with Ann Nelson, of the APS Sakurai Prize "for groundbreaking explorations of physics beyond the standard model of particle physics, including their seminal joint work on dynamical super-symmetry breaking, and for their innovative contributions to a broad range of topics, including new models of electroweak symmetry breaking, baryogenesis, and solutions to the strong charge parity problem." Michael adds, "I am very gratified at being included in this illustrious group, which includes, of course, our own Howard Haber." (SCIPP Member, Professor Howard Haber, was a 2017 recipient of the APS Sakurai Prize.) The prize will be presented at the APS April Meeting on Sunday April 15. October 1, 2017: ATLAS celebrates its 25th anniversary! Discover the history of the Collaboration and join the celebration with SCIPP! ATLAS hunts for new physics with dibosons. Article in CERN Courier includes work done at SCIPP by SCIPPers Natasha Woods, Hass AbouZeid, and Professor Mike Hance! SCIPPers swim for charity: On Saturday, 9/16, twenty-one SCIPPers, ex-SCIPPers and their families participated in two teams in the annual Aquathon to raise awareness and funds for Abilities United, the not-for-profit agency that provides services to children and adults with developmental and physical disabilities. Our A-team, the Physics Aqua-Slugs, swam 104 laps and placed second overall, leaving many "professional" teams in its wake. Our team "Priya's Rhymers" excelled in the following BBQ. What a great conference we hosted at SCIPP/UC Santa Cruz this week. In collaboration with CERN, TWEPP-17 was a success! Thank you to all participants! Congratulations to SCIPP Members, Hartmut Sadrozinski(UCSC), Abraham Seiden (UCSC), and Nicolo Cartiglia (INFN Torino), awarded US Patent No. 9,613,993 B2, granted Apr. 4, 2017 for "Segmented AC-coupled readout from continuous collection electrodes in semiconductor sensors"! SCIPP Member, Professor and Physics Department Chair Robert Johnson, new article in wired.com: "Physicists Try to Revive a Super-Safe, Decades-Old Cancer Treatment"! SCIPP Member, Professor and Physics Department Chair Robert Johnson, in the news with the pCT (Proton Computed Tomography/proton CT) Project! The Large Hadron Collider at CERN has restarted after its Extended Year-End Shutdown. The ATLAS experiment captured first collisions on May 23. SCIPP Member and Physicist Anthony Aguirre to be honored for his appointment as endowed chair in physics of information! December 2016: Just announced! SCIPP Member and Distinguished Professor, Joel Primack, has been elected as President-elect of Sigma Xi. Congratulations Joel! November 2016: Article published this morning on the Symmetry Magazine website, entitled, "Q&A: What more can we learn about the Higgs? ", in which four physicists, one of which is SCIPP Member Howard Haber, discuss Higgs boson research since the discovery with Angela Anderson of Symmetry Magazine (a joint Fermilab/SLAC publication). October 2016: Alan Litke (SCIPP) and David Feldheim (MCD Biology) have been awarded an NIH grant for interdisciplinary neuroscience research using their novel, comprehensive measurements of visually-evoked brain activity. The bulk of the credit for the experimental work goes to SCIPP postdoc Shinya Ito, with important technical contributions from Forest Martinez-McKinney and Serguei Kachiguine. August 2016: SCIPP Members, Jason Nielsen, Peyton Rose, and Jacob Pasner, have had their work with ATLAS Higgs analysis make an appearance in this Physics Briefing article. August 2016: SCIPP Member, Regina Caputo, interviewed for phys.org article, "NASA's Fermi mission expands its search for dark matter"
July 2016: SCIPP physicist and founding director Abe Seiden has been awarded the Lifetime Achievement Award by the US ATLAS Collaboration. The award, which recognizes outstanding service to ATLAS and/or US ATLAS sustained over many years, was announced on June 27 at the ATLAS Week meeting in New York City. The award citation reads as follows: "Abe has been Level 3 manager for Si strips, Level 2 manager for the entire Si system, and a long-time promoter of silicon tracking as well as leader of SCIPP and its significant ATLAS involvement. Abe went on to devote tremendous time and effort to the US program of R&D towards ATLAS upgrades." June 2016: Kfir Dolev, an undergraduate researcher at SCIPP, wins prestigious Goldwater Scholarship. May 2016: The May edition of the CERN courier has the updated ATLAS root s plot with our new W,Z@13TeV results! SCIPP contributors are Graduate Student Alexander Law, Postdoctoral Researcher Chiara Debenedetti, and Professor Jason Nielsen. April 2016: SCIPPer Joel Primack to receive the 2016 Leo Szilard Lectureship Award. March14, 2016: SCIPP members of Particle Physics, Astronomy, and Astrophysics teams, mentioned in the list of Science Team members of The Pacific Research Platform Awarded CENIC's 2016 Innovations in Networking Award for Experimental Applications. March 11, 2016: SCIPP Member, Tesla Jeltema, appointed to serve as a member of the Science and Technology Definition Team (STDT) for the X-Ray Surveyor: An X-ray observing space telescope that would provide greater capabilities than the existing Chandra X-Ray Observatory and ESA's XMM-Newton spacecraft. gravitational waves from the merger of two black holes! December 2015: Research of SCIPP Members Jonathan Biteau, Caitlin Johnson and David Williams highlighted in UCSC News: "Gamma rays from distant galaxy tell story of an escape New observations from VERITAS and other telescopes advance understanding of blazars as cosmic accelerators and as beacons for gamma-ray cosmology"
June 2015: SCIPP Members at CERN working on ATLAS... "Setting Off To New Energy Horizons"
quoted in Santa Cruz Sentinel News and San Jose Mercury News articles regarding the re-start of the LHC. Registration Deadline extended through April 12! SCIPP Public Lecture on Particle Physics and Cosmology: Saturday April 25! March 2015: HAWC to be inaugurated this week! U.S., Mexico to inaugurate facility to detect gamma rays, probe universe's most energetic phenomena! March 2015: LHC to be turned on this month! UCSC News just posted a nice write-up about our SCIPP Physicists and their anticipation of new discoveries with the restart of the Large Hadron Collider! SCIPP Members have been at the forefront of U.S. participation in the LHC and contributed to a major upgrade of the ATLAS detector. March 6, 2015: Higgs boson a la carte? Check out the article in Fermilab Today that reports on Professor Howard Haber's recent paper with Marcela Carena, Ian Low, Nausheen Shah and Carlos Wagner that was published last month in Physical Review D.
April 24-April 25, 2015, Registration now open! January 2015: LSST Camera receives DOE funding approval. 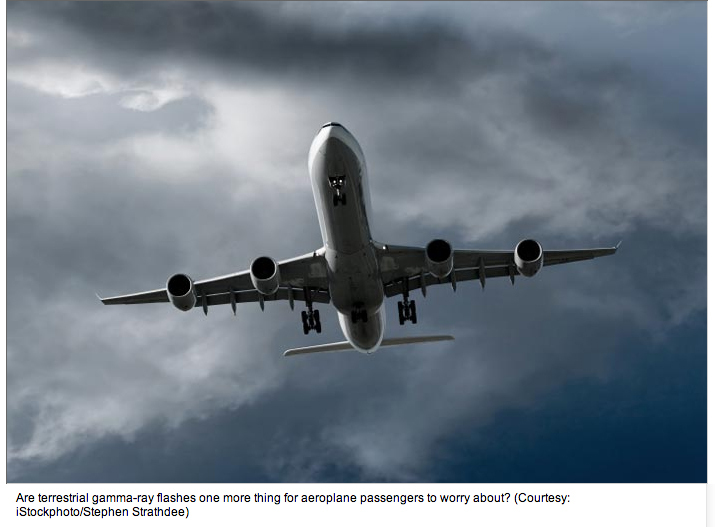 December 2014: SCIPP Member David M. Smith quoted in BBC article about NuSTAR. August 2014: SCIPP Member Michael Dine is quoted in an article in Quanta magazine "At Multiverse Impasse, a New Theory of Scale Mass and length may not be fundamental properties of nature, according to new ideas bubbling out of the multiverse." August 2014: LSST is now officially starting! July 2014: SCIPP QuarkNet Summer High School Students give their sample research data presentations to faculty! July 2014: SCIPP Director Steve Ritz testified this morning before the House of Representatives Committee on Science, Space and Technology, Subcommittee on Energy. The hearing was titled "A Review of the P5: The U.S. Vision for Particle Physics After Discovery of the Higgs Boson". P5 fact sheet. Congratulations to SCIPP grad student Tia Plautz on her recent selection as a 2014-15 ARCS fellow! Congratulations to SCIPP grad student Adam Coogan on his recent selection for the 2014-15 Elmer A. Fridley Scholarship in the Physical Sciences! March 2014: SCIPP will be hosting a Special Screening of the film Particle Fever including Q&A with SCIPPers Alex Grillo, Howard Haber, Jason Nielsen, Stefano Profumo, Ryan Reece, and Sheena Schier at The Nickelodeon Theatre in Santa Cruz! Q&A is immediately following the 7pm opening night showing on Friday March 14! March 5: Particle Fever receives rave reviews in New York Times today! February 2014: SCIPP Member Alan Litke highlighted in Symmetry article, "A second chance at sight"
February 2014: The 48th Annual Faculty Research Lecture will be given by Distinguished Professors of Physics, and SCIPPers, Howard Haber and Abraham Seiden, on Tuesday February 11th, 2014 at 7pm in the Music Recital hall of the Performing Arts Complex. A reception in the lobby will immediately follow the lecture. Doors open at 6:30pm. This event is free and open to the public. January 23, 2014: Congrats to SCIPPer Piero Madau on the 2014 Heineman Prize! December 25, 2013: SCIPP Higgs research included as part of the UCSC 2013 highlights in the Good Times article! November 22, 2013: SCIPP Research Collaboration project, HAWC/High-Altitude Water Cherenkov Observatory, article in nature.com! 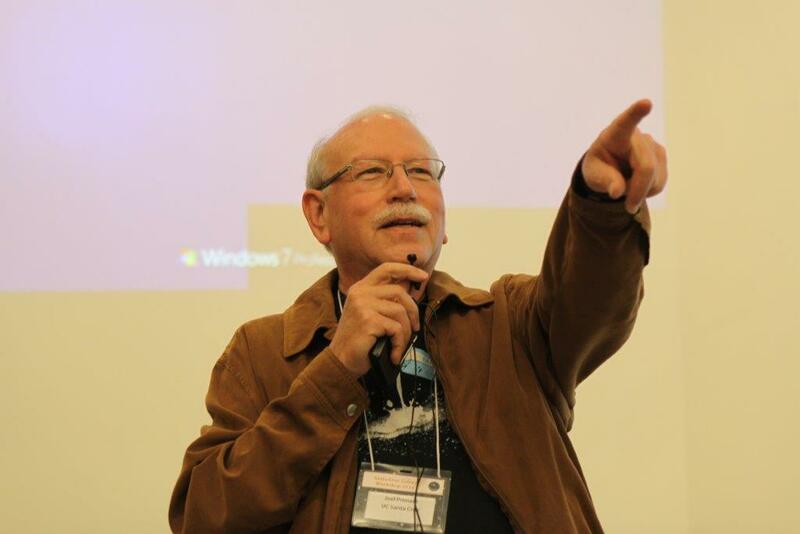 November 2013: SCIPPer Bruce Schumm to speak at UCSC's Institute of the Arts and Sciences will present its second LASER event! US particle-physics community considers future directions. successful search for the Higgs boson! October 10, 2013: SCIPP Member and Adjunct Professor David Williams selected to lead US CTA effort. October 8, 2013: SCIPP scientists applaud Nobel Prize for Higgs discovery! August 2013: SCIPP Director Steve Ritz helped ensure Fermi mission's scientific bounty. 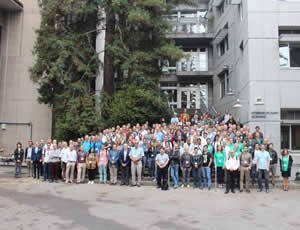 August 2013: SCIPP hosts the 2013 Meeting of the American Physical Society(APS)Division of Particles and Fields(DPF). Physicist Hitoshi Murayama to speak on 'The Quantum Universe' as the public lecturer during the SCIPP hosted DPF 2013! July 2013: UCSC acquires powerful new astrophysics supercomputer system. SCIPP members Joel Primack and Piero Madau highlighted. May 2013: Congratulations to SCIPP Graduate Student, Paul Buzbee, winner of the 2013 UCSC Physical and Biological Sciences Chancellor's Award! Thesis title: "Searches of RHESSI Datafor Weak Signals Associated with Terrestrial Gamma-Ray Flashes". Advisor: David M Smith. David A. Williams and Joel Primack, "Distant blazar is a high-energy astrophysics puzzle". April 2013: SCIPP Member, David Smith, research highlighted in physicsworld.com article, "Dark lightning sheds light on gamma-ray mystery". April 2013: HAWC in the BBC News, "Hawc gamma-ray telescope captures its first image". March 2013: SCIPP Member David Smith interview with KQED, " Attack of the Killer Electrons! New Mission Searches for Mysterious Space Particles". February 7, 2013: SCIPP Member Alexander(Sasha) Sher awarded $2.5 million NIH grant to support research on retinal disease!! SCIPP Member and Physics Professor Anthony Aguirre quoted in NYTimes: The Life of Pi, and Other Infinities. SCIPP Member and Physicist Tesla Jeltema honored by Silicon Valley Business Journal in a special "40 under 40" feature! "For his leadership of the design and implementation of the Fermi Large Area Telescope (LAT) Tracker"! Research by a grad student! November 7, 2012: SCIPP Member Abraham Seiden to speak at SWISSNEX San Francisco, "Hunting for the Higgs Boson"! SCIPP pCT collaboration in UC News! 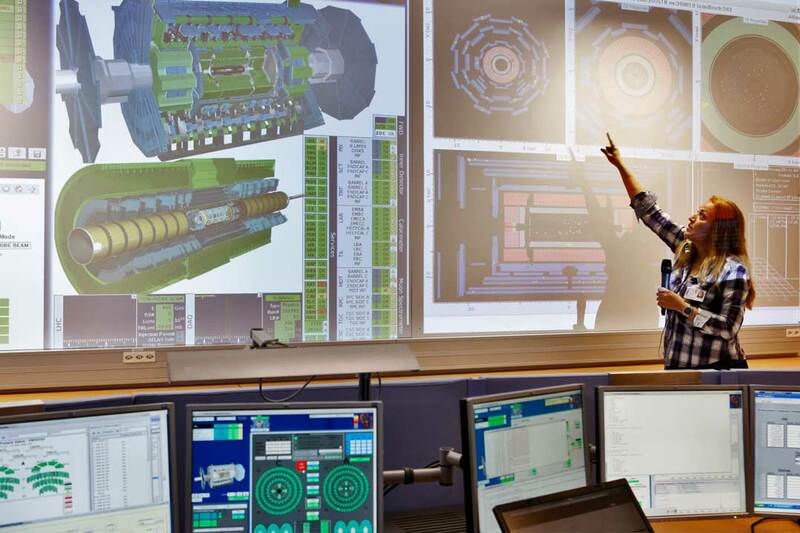 "New imaging technology being developed to guide treatment planning in proton cancer therapy"
September 18, 2012: SCIPP Member Sofia Chouridou in CERN news about ATLAS Virtual Visits! September 18, 2012: SCIPP Member Rebecca Bernstein and the DECam team are on the SLAC front page! 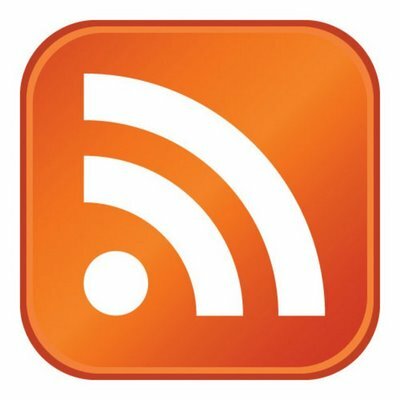 July 2012: SCIPP Member David Smith co-author of article in Scientific American: "Thunderclouds Make Gamma Rays—and Shoot Out Antimatter, Too"
July 4, 2012: Search for Higgs boson reveals new particle! June 15, 2012: SCIPP Member Alexander(Sasha) Sher named Pew Scholar in the Biomedical Sciences!! April 17, 2012: SCIPP / Physics undergrad Melinda Soares highlighted in UCSC's "Uncommon People"! March 13, 2012: American Physical Society Viewpoint by SCIPP Member Howard E. Haber: Homing in on the Higgs Boson. March 1, 2012: SCIPP Member Jason Nielsen joins U.S. ATLAS management team! January 2012: Computer simulations by SCIPP Member Piero Madau, featured in Discover Magazine Top 2011 Stories. January 2012: ATLAS LEGO® model! January 2012: Fermi Satellite appears briefly in the new Mission Impossible movie! 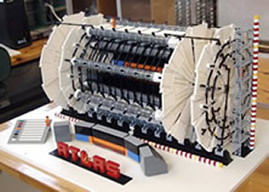 December 13, 2011: ATLAS experiment presents latest Higgs search status. December 13, 2011: NASA's Fermi Shows that Tycho's Star Shines in Gamma Rays. December 2011: ATLAS on the cover of the December Issue of the CERN Courier for the article, "Two years of LHC physics: ATLAS takes stock"! November 15, 2011: Michael Dine, SCIPP Member and distinguished professor and chair of physics at UC Santa Cruz, has received the 2010-11 Outstanding Faculty Award from the Division of Physical and Biological Sciences! November 3, 2011: SCIPP Members Robert Johnson, Bill Atwood, Pablo Saz-Parkinson and others at UCSC are noted in a UCSC Press Release regarding contributions to Fermi findings. November 2011: ATLAS diphoton+MET search (a signature of gauge-mediated SUSY breaking or of universal extra dimensions) on the cover of this week's EPJC! October 28, 2011: SCIPP Members Jason Nielsen and Sofia Chouridou noted in CERN Courier article listing results from ATLAS group! September 27, 2011: SCIPP Member William Atwood has been awarded the 2012 Panofsky Prize in Experimental Particle Physics! August 24, 2011: SCIPP physicists working on the ATLAS experiment at the Large Hadron Collider(LHC) have made the first measurement ever of the ratio of W boson and Z boson production in association with hadronic jets(ATLAS at CERN Article)! The results were presented by Sofia Chouridou at the PANIC11 conference and are available at: http://arxiv.org/abs/1108.4908. July 2011: Supersymmetry hunters from the SCIPP group working on the ATLAS experiment at the Large Hadron Collider(LHC) have reported first results from a search for new particles from gauge-mediated SUSYbreaking in a diphoton + missing energy signature. The results are available at: http://arxiv.org/abs/1107.0561. June 29, 2011: At UCSC on July 6-8, we will have an in-depth review and planning meeting for R&D in the U.S. aimed at upgrades to the ATLAS detector now collecting data at the Large Hadron Collider(LHC) in Geneva, Switzerland. The upgrades aim at improving the capabilities of the detector in the search for new physics at the LHC. Approximately 25 physicists will be participating. 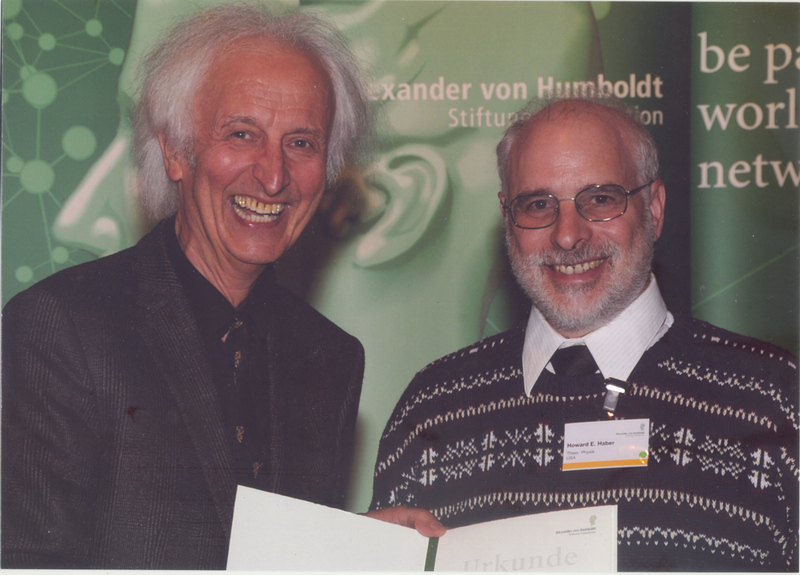 April 8, 2011: SCIPP Member, Howard Haber, receives Alexander von Humboldt Award during winners' symposium held in Bamberg, Germany. The award ceremony took place on Friday March 25. Award presented by Helmut Schwarz, Board of Trustees President of the Alexander von Humboldt Foundation. March 29, 2011: SCIPP Member, Enrico Ramirez-Ruiz, honored for his achievements by the Division of Physical and Biological Sciences at the Science and Engineering Library's, Honored Faculty/Honored Books Exhibit, April 7 - May 6, 2011. January 21, 2011: SCIPP Member and UCSC physicist, Bill Atwood, shares Rossi Prize for work on gamma-ray telescope! December 5, 2010: SCIPP Member, Abraham Seiden was interviewed by the Santa Cruz Sentinel in an article titled, "UCSC coordinating upgrade to Large Hadron Collider: $3.5 million grant funds new detector"
November 2010: SCIPP Neurobiology project article in the CERN Bulletin, "Retina neural circuitry seen with particle detector technology"
November 10, 2010: Check out the NASA Feature, "NASA's Fermi Telescope Finds Giant Structure in our Galaxy!" November 10, 2010: Fermi featured in New York Times article! 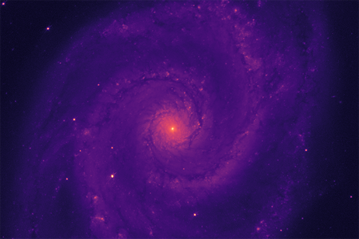 November 10, 2010: Astronomy Picture of the Day features Fermi results! November 9, 2010: SCIPP Member, Bruce Schumm, to be featured on KUSP "7th Avenue Project" again this Sunday, November 14, from noon-1pm! November 9, 2010: SCIPP Member, Enrico Ramirez-Ruiz, named to Mexican Academy of Sciences! November 8, 2010: SCIPP Member, Abraham Seiden, quoted in UCSC News about the newly awarded NSF-MRI grant which will support work on ATLAS at the LHC. SCIPP-UCSC is the lead Institution for this multi-institute award. The full UCSC article is titled "UCSC leads work on first major upgrade for LHC". November 5, 2010: SCIPP Member, Bruce Schumm, to be featured on KUSP "7th Avenue Project" show this Sunday, November 7, from noon-1pm! November 1, 2010: Record luminosity for LHC! October 11, 2010: Researchers use hi-res detector to map neural circuits of the retina. SCIPP Member's, Alan Litke, Sasha Sher, Debbie Gunning and Keith Mathiesion, are co-authors in a paper published in Nature. September 1, 2010: SCIPP Member Stefano Profumo featured in New Scientist! August 6, 2010: Astro2010 `Decadal Survey' report will be made public on Friday, August 13. There will be a webcast of the rollout event starting at 8AM in ISB 102. 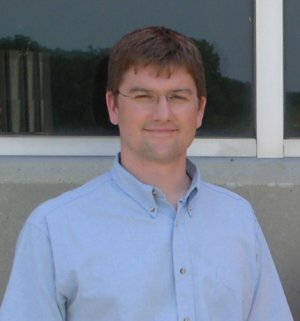 SCIPP Director, Steven Ritz, is a member of the Astro2010 Committee! July 26, 2010: SCIPP Associate DIrector and Fermi LAT team member Robert Johnson quoted in recent BBC News story on Dark Matter. June 30, 2010: Abraham Seiden stepping down after 30 years as Director of SCIPP! SCIPP Members, Tom Banks, Michael Dine, and Subir Sachdev (Harvard) co-directors of the 2010 TASI summer school. May 19, 2010: West Coast LHC Theory Meeting featured in UCSC News! SCIPP will host the West Coast LHC Theory Meeting, Friday May 21, 2010! April 20, 2010: SCIPP Member, Michael Dine, is among the newly elected fellows of the American Academy of Arts and Sciences, one of the nation's oldest and most prestigious honorary societies. March 18, 2010: Fermi LAT Featured Again in Astronomy Picture of the Day (APOD)! March 17, 2010: The first ATLAS physics paper,"Charged-particle multiplicities in pp interactions at sqrt(s) = 900 GeV measured with the ATLAS detector at the LHC" has been submitted to the archive (http://arxiv.org/abs/1003.3124v1) and to Phys. Lett. B. March 8, 2010: Former SCIPP Graduate, PaulineGagnon, featured in Symmetry Magazine article, "Honoring Women in Particle Physics". February 24, 2010: Fermi LAT all-sky image featured on the top American Physical Society website! January 20, 2010: Astronomy Professor & SCIPP Member Enrico Ramirez-Ruiz featured in this week's Good Times Santa Cruz. In the first awards ceremony of its kind, Santa Cruz NEXT honors 4 individuals for their standout creative efforts. January 15, 2010: UCSC 5th Annual Conference for Undergraduate Women in Physics article in Santa Cruz Sentinel. January 5, 2010: An international team including UCSC astrophysicist & SCIPP member, Piero Madau, has used highly sophisticated hydrodynamical simulations of dwarf galaxies to solve a long-standing discrepancy of the cold dark matter paradigm. The results will appear in the January 14th issue of Nature. December 10, 2009: VERITAS Collaboration article from Nature.com, "A connection between star formation activity and cosmic rays in the starburst galaxy M82". December 7, 2009: Article from the CERN Courier, "Protons are back in the LHC"
November 30, 2009: CERN Press Release, "LHC sets new world record"
November 23, 2009: CERN Press Release, "Two circulating beams bring first collisions in the LHC"
November 11, 2009: SCIPP Member Michael Dine is quoted in New Scientist, "In SUSY we trust: What the LHC is really looking for"
November 9, 2009: SCIPP Member Enrico Ramirez-Ruiz & UCSC astrophysicists have developed supercomputer simulations of colliding white dwarfs, providing a new path to detonate "standard candle" type Ia supernovae. A new study published this month in the Astrophysical Journal Letters and featured in a Scientific American article. November 3, 2009: SCIPP Member Michael DIne to guest on NPR's, "On Point!" "7.3 Billion Years Later, Einstein's Theory Prevails" A New York Times article on 29 October features a result from the Fermi Gamma-ray Space Telescope about interesting new limits on models of quantum gravity using faraway gamma-ray bursts. The results are published in Nature. August 27, 2009: SCIPP Member, Enrico Ramirez-Ruiz, UCSC astrophysicist, has an article published this week in Nature discussing the origin of short gamma-ray bursts. August 24, 2009: SCIPP Member Michael Riordan, elected to represent the Forum on the History of Physics(FHP) on the APS Council for a 4-year term as Forum Councilor beginning 1 January 2010. July 21, 2009: SCIPP Member Joel Primack: The new High Performance AstroComputing Center (HIPACC) will focus on computational astrophysics—using the growing power of supercomputers to address the most difficult problems in astrophysics and cosmology. ©2012 The Regents of the University of California. All Rights Reserved.